A Friday finish. 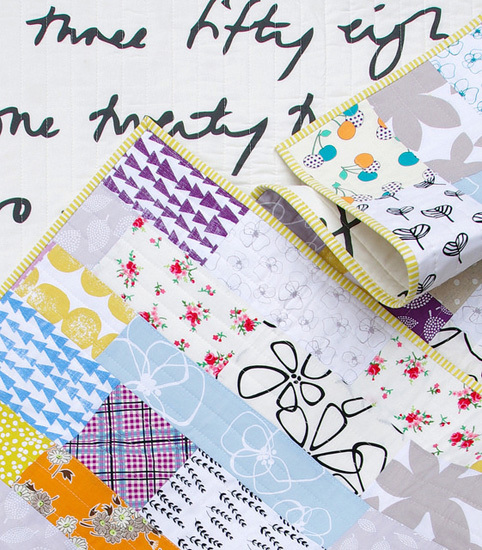 This quilt features several collections by popular designer Lotta Jansdotter; but features more of Lotta's most recent collection Mormor and therefore I refer to it as my Mormor Quilt. This project has been an experiment in mixing pattern (bold/large scale prints and daintier florals) as well as a color challenge. The color purple does not rate in my preferred color palette but now and again I like to push my boundaries. For the back of the quilt I again have used a single fabric - Script Britton Nummer Fabric for IKEA by Emma Jones - because it was still sitting on my cutting table from my last quilt, and because I thought it would work nicely for this modern quilt. My leftover Ikea fabric has now been folded and stashed, and I promise the next quilt will have a different backing fabric. I have quilted this quilt with straight edge to edge vertical lines just one inch apart which creates a lovely texture and complements the modern quilt style. I've used a quilting (bar) guide attached to the walking foot to space the lines evenly. 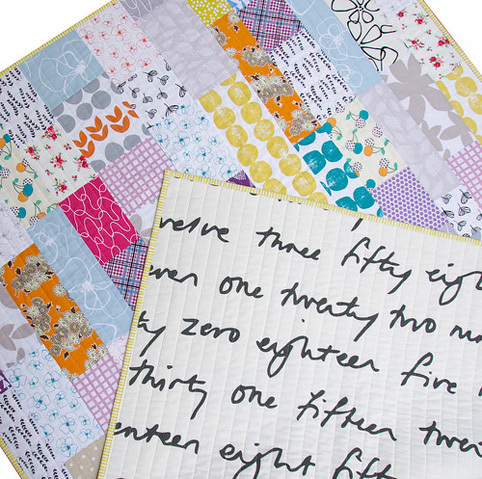 No line marking required when using a quilting guide which is a great time saver. The yellow/white stripe fabric is Straws in Yellow from the Simpatico collection by Michelle Engel Bencsko. This quilt is for sale. It is listed in my Etsy Store. 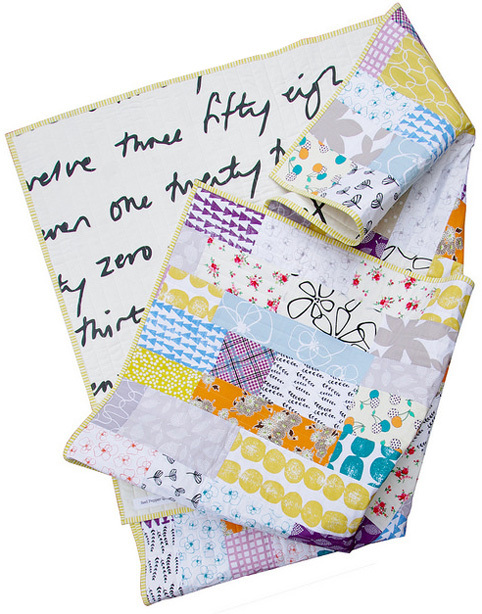 You will find all the listing details here: Modern Patchwork Quilt. Red Pepper Quilts Etsy Store. 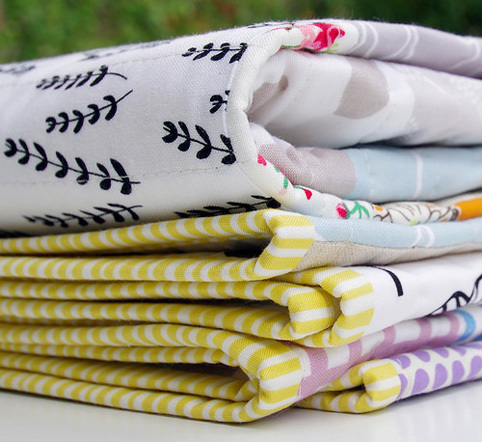 Mormor and Sylvia fabric collections - includes a list of availability from my sponsors. Mormor sounds like "More More!" which is what we want from you! Thank you for sharing your work. A beautiful Quilt! Feeling very inspired... Love the colours and tones. It's lovely, as always. You did good with the purple. :) The quilt wouldn't be the same without it. 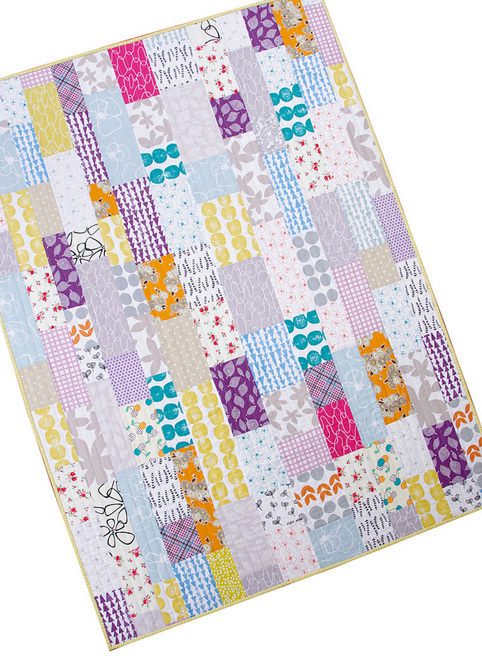 I am curious if when you make a quilt do you randomly choose the fabrics or do you audition them on a design wall before you sew them together. I've always wondered as to your process. Love the modern feel and the purple is the perfect eye catcher. Stunning! Love the way the colours work together, fresh and springy! I love how you have combined ultra modern geometric prints with some more traditional, detailed floral and plaid prints (some Denyse Schmidt?). I never would have thought to combine the two, but the way you have done it really works! Bravo! I love the IKEA fabric backing! I'm thinking of picking some up myself for a quilt that's almost done. Do you prewash your fabrics? I don't and I'm wondering how the IKEA fabric holds up when the quilt is washed. 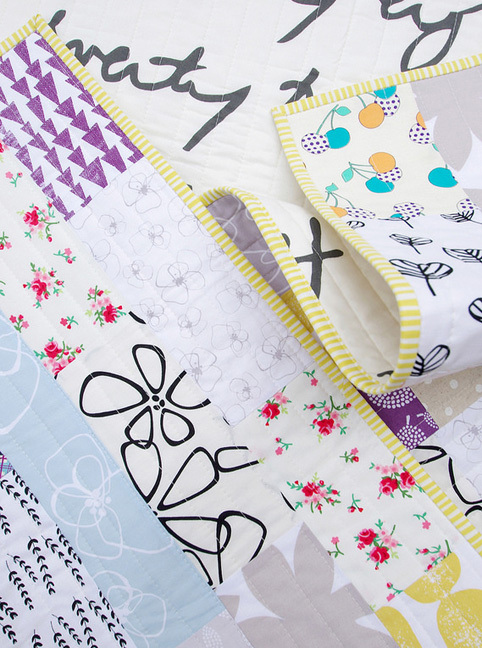 This quilt has a great contrast of fabric and still goes together - brilliant! By the way, mormor is the swedish word for grandmother or mothers mother. 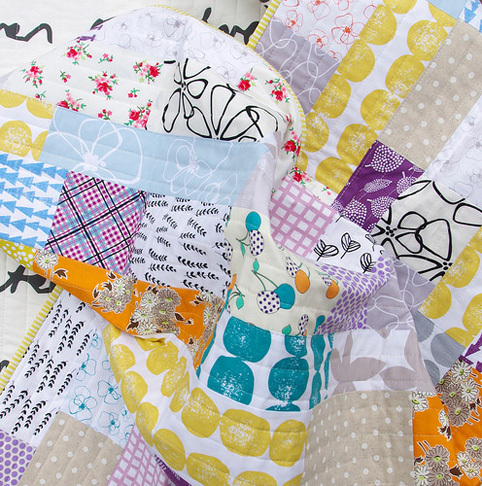 Oh, how I like the mix of fabrics in your Mormor quilt, and I especially like the fabric you chose for the back. I love quilting in the straight lines, but I usually do a cross grid. Maybe I will try just the up and down this time. I really like the way yours looks. Congrats on selling this quilt in less than a day! I clicked over to your Etsy shop and was not surprised to see a smart shopper snatched it up quickly. 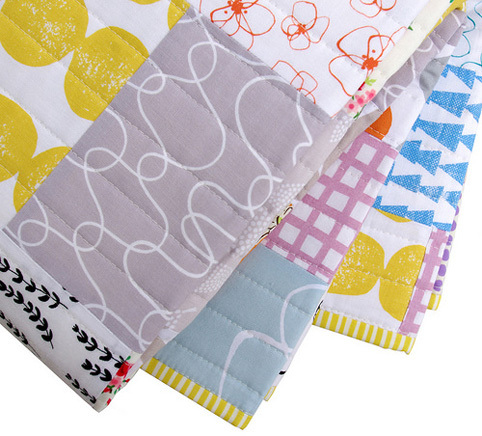 Your use of the new Lotta fabric has inspired me to pick some up for an upcoming project.